For the most part I have enjoyed Benjamin Percy's Green Arrow very much, though Percy's pre-Rebirth Green Arrow Vol. 9: Outbreak was a study in how an artist can affect a writer's story; I adored the chapters drawn by Patrick Zircher, but couldn't find the same affection for Percy's writing under Szymon Kudranski's art. I wonder if the same is at play in Teen Titans Vol. 3: The Return of Kid Flash; I liked the chapters by Khoi Pham much more than those drawn by Scot Eaton. But then again not any of it really works for me; surely I'd take Percy's Green Arrow collaborators Otto Schmidt or Juan Ferreyra over anyone on this book, so maybe Percy is a writer for whom my enjoyment is distinctly tied to his artist. Bottom line, ever since Geoff Johns' early Teen Titans issues, this DC Comics property has struggled to find its groove, and Percy's run still wasn't it; now we find ourselves on the precipice of yet another run and I'm dubious if that is going to be the return to greatness either. The third volume of the Rebirth Teen Titans touts the return of Kid Flash Wally "Wallace" West, but it's a dubious claim reflecting some of this book's wishy-washiness; yes, Wally does return to the team here, but not in so much epic fashion as the Titans just go and ask him to (he's not even on the cover). Setting aside a couple of crossovers the Titans have been drawn into lately, Kid Flash has been gone from this book roughly three issues or not much more than half a trade, and so the ballyhoo over his return feels forced. Though this is the better of the two main stories in the book, with guest appearances by Green Arrow's Emiko Queen and Onomotapea and art by Khoi Pham, it is just as plain overall as much of Percy's Titans. The team members have few individual motivations or storylines, and we know so little about Raven that her on-again, off-again romance with Kid Flash has no real nuance nor amounts to much beyond a boilerplate romantic storyline just for the sake of it. The second main story is a three-parter spotlighting Beast Boy. Here again, it's not as though Percy mistreats the characters, but there's little in the way that's markedly surprising; Beast Boy feels like a joke, he hooks up with a woman marketing virtual reality implants, lo and behold the implants are evil and the Titans have to fight to help Beast Boy get hold of himself. Percy flashes back to when Gar Logan was infected with the disease that turned him green, but in a virtual reality turn, he actually isn't infected; among the themes of the story is Gar's loss of his parents, but his parents' death and the receipt of his powers seem conflated. Gar's motivations here are tied to his origins, but Percy never clarifies Gar's current origins and instead muddies them further. The villain, heavily pierced and with a half-shaved head, claims to advocate for the cause of "weirdos," but then incongruously Percy has her wanting to present a more traditional appearance when she speaks to her fans. One senses that the end of Percy's run came on suddenly, since the teaser at the end of Teen Titans Vol. 2: The Rise of Aqualad doesn't match up to the Beast Boy plot here. Scot Eaton's art in the story seems dark and crowded, along basic superhero comics lines. There's a particular scene-setting in the penultimate chapter where Eaton shows the exterior of the damaged Titans tower, but then somehow the audience is supposed to intuit the team is inside a T-jet. When a building collapses, Aqualad is shown jumping essentially over nothing; in the climax, he supposedly uses water to bind mind-controlled foes, but it's hard to actually discern it working. There's also a DC Holiday Special 2017 story here by Shea Fontanta and a Starfire spotlight issue by Marv Wolfman. The Fontana story is fine in its genre, put a step above by art by Schmidt. Wolfman's story was better than I expected; I could give or take that the Psions suddenly appear, but Wolfman's got a funny bit, which continues into Percy's final issues, casting Starfire as the team's "space mom." If 1980s pinup Starfire is now considered "old," we might as well all go out to pasture, but I thought this was a clever recognition of how much younger the Teen Titans seem to get every year. 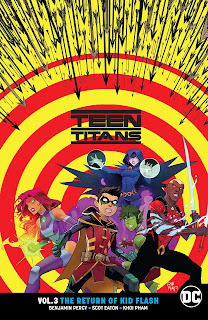 The New 52 Teen Titans was not superb, at least not for very long, and the secondary relaunched, renumbered New 52 Teen Titans was particularly rough. That's five years already worth of troubled Titans stuffs, and the 100 pre-Flashpoint issues before that also had their share of troubles, at least for the last 50 or so. That's at least a good ten years where DC Comics's Teen Titans hasn't been working, once one of their hottest properties. Benjamin Percy bows out with Teen Titans Vol. 3: The Return of Kid Flash; next up comes Adam Glass, whose Suicide Squad run was sometimes good, sometimes too violent and irreverent. A team of new characters with names like "Crush" and "Roundhouse" (and with a too-old-looking Damian Wayne on the cover) gives me a lot of pause; Teen Titans is a problem DC needs to solve, and I'm not sure if they've done it yet or not. It really is a shame that this book never came together. I loved the art and the line up in the first book but the story never really seemed original or even that interesting. I tried volume two because I really enjoyed Geoff Johns's take on Aqualad in Brightest day and his characterization on Young Justice but his introduction left a lot to be desired. I couldn't bring myself to buy volume three. I think the last time the Teen Titans was written well was under JT Krul. He really got the voice of the characters and Scott's art brought the characters to life. It was clear he had a vision of what to do with Superboy, Wonder Girl, and the rest of the gang. Hell, he even made Damien likable in an era where I really loathed him. It was a shame DC thew all the work Krul did getting the book back on track when they rebooted things with the New52. I am hoping that Bendis's Young Justice book will be the Teen Titans book we all hoped for. It at least is bringing back the core of the Geoff Johns team. I would love if he could actually make Aqualad into a viable character too. Seconded; I really liked JT Krul's Teen Titans: Team Building at the time, but then he lost the title with the advent of the New 52. "One senses that the end of Percy's run came on suddenly..."
I'm curious if Percy had some falling-out with DC. On top of Teen Titans, his Nightwing run was shut down just a few issues in, and mid-storyline, to boot!